Where does EA belong in the enterprise? Typically, EA is a program situated under the Chief Information Officer (CIO) i.e. in the Information Technology department. However, to maximize its effect on the end-user, EA should be elevated to a strategic mission-business functional area of the organization, for example under the Chief of Staff or similar such prominent function. It will be easier to capture and analyze information in the organization, because EA has a broader mandate and vantage point from which to conduct its activities. It will have the ears of executive management and therefore be in a better position to implement its recommendations and plans. It will be better able to synthesize business and IT information, because it will be functionally independent and will not be seen as biased or simply an extension of the CIO. It will be able to focus on identifying the information requirements from the business side of the house and to drive technology solutions from the IT side. Business will drive technology (rather than investing in new technologies for their own sake i.e. because they are new and “cool”), and therefore IT investments will align with business outcomes and improved organizational performance. What do you think ─ should EA be part of the “IT shop” or should it be somewhere else in the organization? Traditionally, IT governance is viewed by the end user as an impediment to getting their IT projects done. It is seen as another opportunity for the IT department to say no or to throw up obstacles. The perception is that governance is a cover for the IT department’s own inefficiencies or inability to get the job done, lack or resources or know-how; or is due to the subjective whims of the IT senior staff and CIO. However, in user-centric EA, governance is a help (not hindrance) for users in developing and implementing successful IT projects. The way user-centric EA does this is it manages governance, bringing together the enterprise’s subject matter experts from both the business and IT sides of the house and applying their collective knowledge and best practices to facilitate IT project success. In user-centric EA, it’s not about saying yes or no -- although of course that is inevitable in approving projects, prioritizing them, and allocating funding -– but rather it is about achieving best value from limited resources and ensuring those investments are successfully deployed. In user-centric EA, IT governance is implemented to meet the needs of the user community and IT stakeholders -– to help make IT projects a success! Do you use user-centric IT governance? Or is this just a pipe dream? Why was Human Capital left out of the Federal EA? 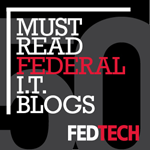 What’s missing in the Federal Enterprise Architecture (FEA) is the Human Capital Reference Model. The Human Capital perspective is critical in a user-centric EA. Additionally, while FEA looks at security as a cross-cutting architecture perspective, I like to call it out as its own EA perspective (for emphasis), particularly in a defense or law enforcement environment. Finally, to the point, human capital are the people and organizational entities that conduct both the mission-business and technology functions of the enterprise. John Zachman, the founder of modern-day EA included people (or the who) as one of the perspectives in the Zachman Framework. This makes intuitive sense to me. In order to focus on meeting the requirements of the EA end users, we need to provide for a view of people in the architecture itself. For example end-users need to know who are the key players in the enterprise. Users also need to understand how they align to mission execution and how they will be measured for results. The enterprise and the users need this to build a sustainable high performing organization. Why was Human Capital left out of the FEA? Would like to hear any thoughts or opinions on adding a human capital perspective to FEA. Technology-astute organizations know that user-centric EA is an elixir for much that ails their IT function. In user centric EA, business drives technology rather than technology being implemented for technology’s sake. In user-centric EA, the EA program owns the structure of the information, not the contents. On the other hand, the business programs and technical subject matter experts own the contents of the EA, and are responsible for ensuring that it remains current, accurate, and complete. EA Product Stewards are the EA team members that develop and maintain the structure of the information products. The stewards are responsible for understanding user requirements, designing information products to fulfill these, facilitating the capture of information, analyzing and cataloging it, serving it up to the user through robust delivery mechanisms (such as EA website, handbooks, CDs, and so on), and keeping the information under strict configuration management. In these ways, the stewards ensure the products are relevant, understandable and accessible to the end-users. EA Product Coordinators serve as the content managers and approval authority for new and changed information in the architecture. The coordinators are responsible for participating in the development of the agency’s EA and ensure ongoing updates as new information becomes available. In this way, the coordinators ensure that the information in the EA stays relevant to the end-users. By having these complementary roles of product coordinators and stewards, for developing and maintaining the EA, the users are assured useful and usable information for their needs. At the end of the day, user-centric EA is about focusing on the user! We have know who they are, communicate with them, understand their needs, and work to fulfill them. As this cartoon shows if we don’t read our users needs correctly, then the result is “starship enterprise” architecture rather than genuine user-centric EA. Finally, Rule #5 is make it accessible. EA information is a wonderful tool, but to be valuable to the end-user it must be accessible to them when and where they need it. Therefore, you need a robust delivery mechanism for the information. At our agency, we provide EA and governance information in multiple delivery channels. For example, the EA information is provided through a knowledge portal on our website as well as through printed handbooks and so on. Our EA website homepage has our knowledge center that is the navigation mechanism to get to all product information in the repository. The information is available to users 24/7. Rule #4 is separate the forest from the trees. What this means is that we provide the users EA information in various levels of detail that is tailored to their particular needs in the organization. Moreover, each level of information is drillable (or clickable) to the next, so that user can navigate between information views. For example, in our agency, we use a three level metamodel representing high, medium, and low, or what we call, profiles, models, and inventories. Profiles are high-level, big-picture strategic views of the information; it’s the satellite view from 30,000 miles up, providing information to the executive in a quick, condensed format, usually a graphic. Inventories (or catalogues) are the detailed views of information usually in database or spreadsheet format, that is typically used by the analyst. It’s the trees versus the forest; the distinct configuration items with lots of information about each one. Models are the connection between the forests; they illuminate relationships between information that is especially useful to the mid-level manager working with his/her peers. These relationships include those that show how processes work, how information is exchanged between entities, or how systems interoperate. In user-centric EA, it's not one size fits all! Rule #3 is show, don’t tell. •This means that a picture is worth a thousand words. It’s all about using information visualization effectively. •For example, in my agency's network profile, we show a graphic of the United States. We show the nodes on the map, each representing a major communication hub. We show alignment of these nodes to the agency's districts. And finally, we show the connectivity between the nodes, including the type of communication lines. •This network profile can be used, for example, to envision connectivity being disrupted, whether through man-made or natural disaster, and how this would affect mission execution. This is a tool for helping us plan for continuity of operations. Rule #2 of user-centric EA is Keep It Simple, Smart (Person). Executives and decision-makers are busy people and do not often have the time or patience to decipher what you are trying to say. That is why we need to keep things straightforward and focused! For example, in my agency, we have our Business Profile, which identifies our major functions. It is categorized into three, simple, color-coded functional areas (core mission, mission support, and business support). •Under Core Mission, we have the mission programs of the agency (such as Search and Rescue, and Defense Readiness). •Under Mission Support, we have the functions that directly enable the performance of core mission, such as logistics management, command control and communications, and training. •Under Business Support, we have the back-office functions, such as finance, HR, legal, public affairs, etc. We use this simple graphic as a starting point for understanding what we do, who we are, and what our organizational identity is. I have presented this to senior executives in the agency and have received kudos for taking the functions of a large, multi-mission maritime organization and making it simple for anyone to understand. From my experience, there are a number of ways to transform your EA into a user-centric model. In this post I will talk about the first one: Have a clear value proposition. Remember, doing EA because "it's the law" (Clinger-Cohen Act) is not focusing on the users! One example of a clear value proposition is that "EA will improve our IT planning and governance" (and thereby enable better decision making by the end users). It was not until I started speaking in these terms that anyone in my agency would give me the time of day. Well, this is exciting...my first blog, dedicated to a subject that I am passionate about - user-centric enterprise architecture. 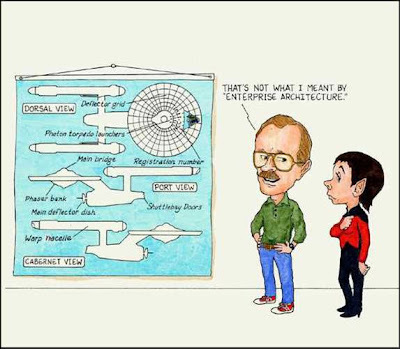 Enterprise architecture (EA) is the discipline that synthesizes key business and technical information across the organization to support better decision-making. EA includes the development, maintenance and use of an as-is, to-be, and transition plan. Together, these serve as the blueprints for modernizing and transforming an organization to meet future mission capabilities and requirements. The goal of EA is to improve information technology planning and governance. User-centric EA focuses on providing useful and usable products and services to the end user. In user-centric EA, information is relevant, easy to understand and accessible. In contrast, traditional EA is user-blind because the focus is on developing "artifacts" that are often unintelligible. Therefore, in traditional EA, users often have difficulty understanding the as-is, to-be, and transition plan.